← Two new prototype MagicBands discovered and one is teal colored! There is a special MagicBand being given out this 2015 to Disney VIPs (very important persons), and I’m happy that I can finally share it with you. I’ve known about this band since early April but was asked to keep quiet for a while. Well, I finally obtained the band for myself so I can spill the beans about this new graphic MagicBand. Certain executive Disney employees visit Walt Disney World from time to time and are considered special visitors. These employees are not usually associated with the theme parks on a daily basis (such as an executive from a sales division), so Disney wants to make their visit to Walt Disney World feel important. Part of the way they do that is by providing them with a special graphic MagicBand just for them as a gift. As you can see, this VIP MagicBand is yellow with some special graphics on it. The purpose of the graphics is to make the band feel more like it’s a gold color with some bling. 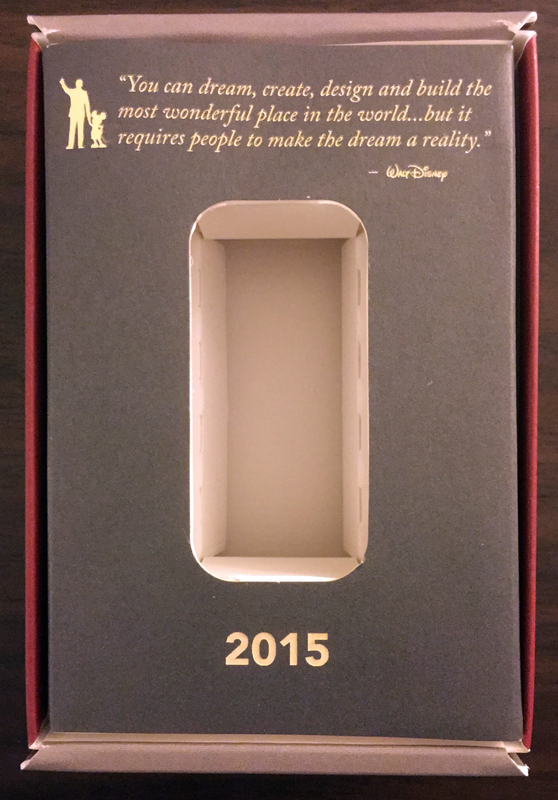 It also comes in a Cast Member exclusive box, but instead of the employee’s name imprinted it says 2015, so even the box is somewhat unique. The back of the band is standard and doesn’t contain a name or say “limited” or anything like that, but I have been told that only 250 of these VIP bands were made this year. This won’t make any special lights/sounds at FP+ touchpoints. The official name of this band within the Cast Member system is listed as “VIP 2015”. 12 Responses to "This special 2015 MagicBand has been made for Disney VIPs"
I really like the idea!!!! I like these a lot, way nicer than my regual yellow band! Have you heard anything about if the frozen summer party is going to get another limited edition band? Other than mickeys Halloween party what do you think the next limited edition band will be? No, none for the summer as far as I know. Food & Wine Festival will be the next one. Hi Ethan. What is a fair price for this band deactivated? I’ve been tracking one on eBay but I think they want way to much. It’s at $999 now. I’m thinking half that… thoughts? I have the 2016 so I’d love to add this one to my collection. The band is worth $500 or so. $1000 is ridiculous. Only the E-Ticket band and maybe one or two others may be as high as that. I love the E-Ticket band! Haven’t seen one for sale yet though. I just started collecting the bands and would love to pick your brain and ask you a few questions if your up for it? I am negotiating a price with the seller. They want a little more than I want to pay. I guess my main question is when could I even see one of these for sale again? My guess is they don’t come on the market to often. Maybe never again, honestly. I say if it’s something that you can afford, go for it now. I was surprised to even see it listed. I got one of these when I visited Disney World to explore the possibility of having our company’s trade show there. What an amazing visit! I’m actually selling mine on eBay right now, no real need for it and I have plenty of other personalized momentous from that visit.